TV, eh? Rewind: SportsDesk | TV, eh? Get out your hockey sticks and baseball bats — this week Rewind looks at SportsDesk. 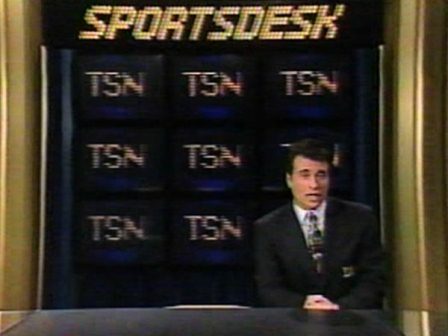 Taking the form of a more traditional newscast when compared to the noisy and flashy successor SportsCentre, SportsDesk (TSN, 1984-2001) was the sport network’s flagship broadcast. SportsDesk‘s intro, opening music and graphics were more lively when compared to network newscasts from the same era and often felt remarkably true to the time when each were put into place. However, when SportsDesk tackled stories like the loss of the Winnipeg Jets for example it could get dull, dreadfully dull. Choosing to fill a few minutes with meaningless sound bites then going to some banter between the hosts and a more traditional story of getting reaction of the news from two or so people in a crusty looking bar, it felt squarely aimed at the die-hard sports fan who could tolerate anything as long as it dealt in some way or another with sports. TSN did try to jazz up its reports by adding some cheesy background music but that didn’t really do much to help. As with SportsCentre and many other sports news shows, during a typical episode of SportsDesk you had to sit through some mindless jibberjabber from athletes. The sound bites that make it onto the air often have them sounding like airheads, talking about winning and team effort and what not. By the late 90s SportsDesk released a series of humorous commercials and the light-heartedness of the successor show, SportsCentre began to take hold. With the advent of tickers on cable news and the excessive bombardment with random boxes of information like Toronto’s cable news network CP24, TSN has since developed a complex ticker that airs at the bottom of the screen during its current flagship sports news broadcast, dubbed the Bottom Line. As SportsDesk evolved into SportsCentre it represented quite a shift in philosophy in Canadian television that it too should mimic the glitz of American television, down to the loud music, the obnoxious and nonsensical graphics, the in your-face-TV personalities, and even further down to being rather shallow and losing focus of what it was set out to do in the first place. Today, SportsCentre‘s signature seems to be its dash of humour thrown into virtually every episode such as playing out the suspense of revealing where SportsCentre would be broadcasting from on the road by pulling out a piece of paper revealing the location out of an envelope reading “Top Secret” written in marker or having a segment filmed in a zoo. Sometimes snark is hidden in a recap of the day’s sporting events, but with the show going by at lightning speed, it’s easy to miss. While SportsDesk might be off the air, you could catch its successor SportsCentre daily on TSN and TSN2 and Saturday mornings on CTV. it’s a shame that due to such pressure put on by the American heavy’s, that we always have to follow suit. Or maybe it is what distinguish’s our society’s!